Spitzer seen against the IRAS/COBE mission's infrared view of the Milky Way. 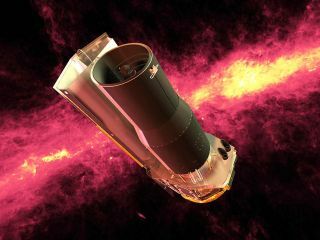 WASHINGTON —The team behind the Spitzer Space Telescope, a mission reluctantly recommended for termination by a NASA-chartered panel of scientists, was set May 30 to send the agency a last-ditch proposal to keep the 11-year-old spacecraft operating, a senior project official said. Since its cooling reservoir of cryogenic helium ran dry in 2009, the infrared telescope has been using only one of its three instruments. Spitzer's 2014 budget is about $16.5 million, and it will have to make do with less in the future now that the 2014 Astrophysics Senior Review has recommended ending the mission by Sept. 30, 2015, said George Helou, deputy director of the Spitzer Science Center at the California Institute of Technology in Pasadena. Spitzer likely can operate through 2018, Helou said. To get there, the project will have to trim its full-time staff, discontinue some engineering support services and cease efforts to make spacecraft operations more efficient, Helou said. There are about 45 full-timers on Spitzer now, including 27 at the Spitzer Science Center. The others are at NASA's Jet Propulsion Laboratory in Pasadena, which is run by Caltech, and Lockheed Martin Space Systems of Sunnyvale, California, which built the telescope. The recommendation to discontinue Spitzer was part of the 2014 NASA Astrophysics Senior Review, which reported its results May 15. In a senior review, which for astrophysics missions takes place every other year, a group of scientists decides whether it is worth the cost of continuing missions that have achieved their primary science goals. In the 2015 NASA budget request released in March, the White House proposed ending the extended mission of Spitzer, NASA’s fourth Great Observatory, next year. The 10-person review panel endorsed the proposal with the caveat that losing Spitzer would be a blow to the science objectives the astrophysics community laid out in 2010 in its latest decadal survey, "New Worlds, New Horizons in Astronomy and Astrophysics." "With that, I agree absolutely," Helou said. The latest senior review covered 11 missions, including three operated by other space agencies with NASA as a junior partner. The remaining missions were NASA-led, and two of these, the flagship Hubble Space Telescope and the Chandra X-ray observatory, were reviewed separately from the other missions seeking extension funding. Hubble, which launched in 1990. The Fermi Gamma-ray Space Telescope, a gamma-ray observatory launched in 2008. The Kepler Space Telescope, which launched in 2009 to search for potentially habitable extragalactic planets and is now operating with only two of the four reaction wheels it uses for position control. The Nuclear Spectroscopic Telescope Array, a small X-ray telescope that launched in 2012. The Swift Gamma-ray Burst Explorer, which launched in 2004. The European Space Agency's X-ray Multi-Mirror Mission-Newton. NASA contributed to the mission’s instrument package in exchange for 30 percent of the telescope’s guest observer time. Planck, another ESA mission for which NASA bartered hardware for data. The observatory was switched off in 2013, but analysis of the data it gathered, pertaining to the origins of the universe, continues. The Suzaku/Astro-E2 mission, a joint NASA-Japanese Aerospace Exploration Agency mission that lost its NASA-built, cryo-cooled XRS-2 instrument just after launch in 2005 and has since been operating in warm mode with its other two instruments. For Hubble and Chandra, the senior review was more checkup than competition. NASA Astrophysics Director Paul Hertz said in a January interview that the flagship observatories were virtually guaranteed to get extended mission funding unless the review turned up major problems. That left six NASA missions to compete head to head for funding nested in the Astrophysics Division's Other Missions and Data Analysis account. In April, Hertz said that account would be about $10 million short of what it would need next year to continue operating all of the missions. The losers were Spitzer and MaxWISE, a proposal to use data gathered by the Wide-Field Infrared Survey Explorer, which NASA reactivated this year, to look for brown dwarf stars. The senior review panel recommended that NASA pursue this mission, which could have been accomplished "for a modest input of funds." NASA, in its response, said approving MaxWISE would "displace funding from higher rated operating missions in the Senior Review."